A blood-drinker that is not a vampire, The Empusa. Like Lamia, Empusa starts off as a demigoddess; the daughter of Hecate and Mormo, who seduces men into her bed before she drains them of their blood and eats their flesh. She is described as having fiery hair and wearing brazen slippers, which due to her name meaning "one footed" has made artists depict her as having one hoofed leg and a brass prosthetic leg. Like Lamia, in modern depictions, Empusa was shifted into a race of creatures that serve Hecate as guardians of her roads and devourer of travelers. They are still depicted as having a single hoofed leg. 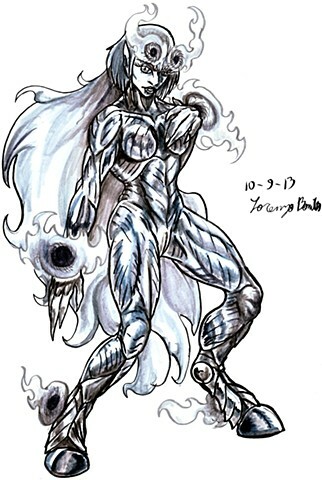 For my depiction of the Empusa, I stuck with her having hooved feet, but made her entire body appear metallic. For her hair, I gave her a base bob cut while having a fiery outer layer behind her as spectral flame constructs float over her.